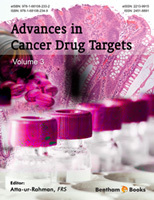 The 3rd volume of the book Series “Advances in Cancer Drug Targets” comprises eight chapters written by the leading experts in this field. It is an outstanding collection of well written chapters on cancer drug targets in the field of pharmacology, molecular biology and biochemistry. Human neutrophil elastase (HNE) plays an important role in the development of chronic obstructive pulmonary diseases. In chapter 1, Alix et al., explain its involvement in non-small cell lung cancer progression. Natural compounds and/or synthesized agents which antagonize HNE activity have been comprehensively reviewed in this chapter. They also focus on substances (i.e. lipids and derivatives, phenolics) that exhibit an inhibitory bifunctionality towards HNE and matrix metalloproteinases (MMPs), particularly MMP-2. The efficacy of cancer-immunotherapy with complement-activating monoclonal antibodies is restricted by over-expression of one or more membrane-bound complement regulatory proteins (mCRPs: CD46, CD55, CD59) that are present on the surface of neoplastic cells. Kirschfink et al., in chapter 2 discuss small interfering RNAs (siRNAs) for posttranscriptional gene knock down of CD46, CD55 and CD59 aiming to sensitize tumor cells. Hepatocellular carcinoma (HCC) is the third most common cause of deaths from cancer worldwide. There is growing evidence that the deregulation of Wnt/β-catenin signaling pathway plays a critical role in hepatic oncogenesis and mainly occurs at the early stage of hepatocarcinogenesis. In chapter 3, Kim and Wands have summarized the potential molecular targets related to the Wnt/β-catenin signaling pathway along with their therapeutic applications. A major challenge in treating ovarian cancer is to overcome intrinsic and acquired. Chapter 4 by Ahmed et al. presents the recent advances in our understanding of the cellular origin and the molecular mechanisms defining the basis of cancer initiation and malignant transformation with respect to epithelial-mesenchymal transition (EMT) of ovarian cancer cells. Due to the high expression of Survivin in various carcinomas, it is one of the key antiapoptotic proteins. It is also associated with their biologically aggressive characteristics and drug resistance. Bisen et al., in chapter 5 elaborate the efficacy of combination of oxaliplatin and paclitaxel as a potential strategy in controlling HNSCC cell proliferation. This review highlights the fact that the co-treatment of cells with paclitaxel and oxaliplatin results in a significantly higher cytotoxicity as compared to individual single drug treatment. Melatonin has oncostatic effects on different neoplasias, particularly on estrogen-dependent breast cancer. The compound acts by interacting with estrogen-responsive pathways, thus behaving as an antiestrogenic hormone. In chapter 6 by Cos et al., evidence is presented that that melatonin could exert its antitumoral effects on hormone-dependent mammary tumors by down-regulating the sulfatase pathway of the tumoral tissue. Recent studies have thrown light on the role of mammalian target of rapamycin (mTOR) in the regulation of tumor cell motility, invasion and cancer metastasis. Zhou and Huang in chapter 7 discuss the mTOR complexes and the role of mTOR signaling in tumor cell migration and invasion. The chapter also highlights the findings about the mechanism by which rapamycin inhibits cell migration, invasion and cancer metastasis. It has been hypothesised that a phenyl hydroxylamine group linked to a second aromatic moiety generates a pharmacophore which can interact with Ras and inhibit its activation In chapter 8, Peri et al., present reports on the synthesis of a library of small molecules with arylamides and arylsulfonamides groups. They also explain their biological activity to inhibit nucleotide exchange on human Ras. I hope that the current book volume, which provides insights into the development of new approaches to anti-cancer therapy for interested researchers and pharmaceutical scientists, will be received with the same enthusiasm as the previous volumes of this Series. I am grateful to the valuable contributions made by the authors. I greatly appreciate the assistance from the editorial staff, particularly Mr. Mahmood Alam (Director Publications) and Mr. Shehzad Naqvi (Senior Manager) for their hard work and determined efforts.